Explore this magical woodland garden and discover some of Perthshire’s most fascinating plants and wildlife. The garden was created by Bobby and Betty Masterton. When they arrived in the 1950s there were a few trees – conifers, beeches and oak, but more notably the two magnificent Wellingtonias you can see today. One of them has a girth of over 11m. Although over 150 years old, these natives of North America are still youngsters as the trees can live for a thousand years. The Mastertons had a particular interest in Himalayan plants which thrive in the Cluny's perfect conditions. Many of the seeds they grew are now large trees, such as the Tibetan cherry, notable for its mahogany peeling bark. Perennials that flourish here include lilies (including some over 4m high) and Meconopsis (blue poppy). Since 1987 the garden has been cared for by their daughter Wendy and her husband John Mattingley. keep to the paths by following the numbered route around the garden. take care walking around the garden in wet weather; walking sticks may be borrowed. there are a number of steps both up and down the garden but please just take your time going around and make use of the wooden seats..
do not pick any flowers or seed heads. if you would like to buy any of the plants on sale, leave the money (or cheques made payable to Cluny House Gardens) in the box on the plant stall. Unfortunately we do not have card facilities so please remember we are cash only, thank you. Opening times: 10am – 6pm mid February to early November. Opening time from mid November to mid February is 10am until dusk. Over the winter we ask for a donation towards squirrel and bird food. If you are visiting Cluny we would plead that you are honest with your entrance money. We are finding some visitors are being dishonest. The charge is £5/adult . To keep Cluny open to the public does require a large sum of money. Also many, many hundreds of pounds are spent on squirrel and bird food annually so that all visitors have a fantastic opportunity of seeing wildlife very easily. We also sell a variety of home-produced plants suitable for woodland gardens. Our own seed is available for sale during the season at the garden and by post throughout December and January. We also have a unique selection of Cluny postcards for sale. They include the plants and the red squirrels. 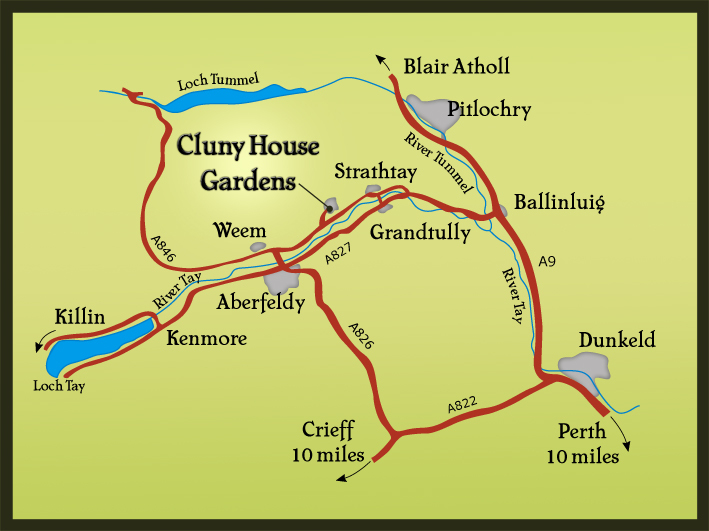 Cluny is one of the sites included in the Perthshire Big Tree Country Heritage and Access project, celebrating the amazing woodland heritage in the area, and co-ordinated by Perth and Kinross Countryside Trust. If you see one of us working in the garden and you have any questions, we would be delighted to answer them, if we can. Take a look at our resident squirrels in action.